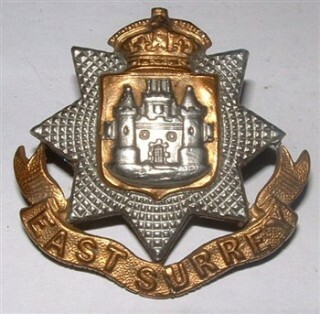 Cap badge of the East Surrey Regiment. 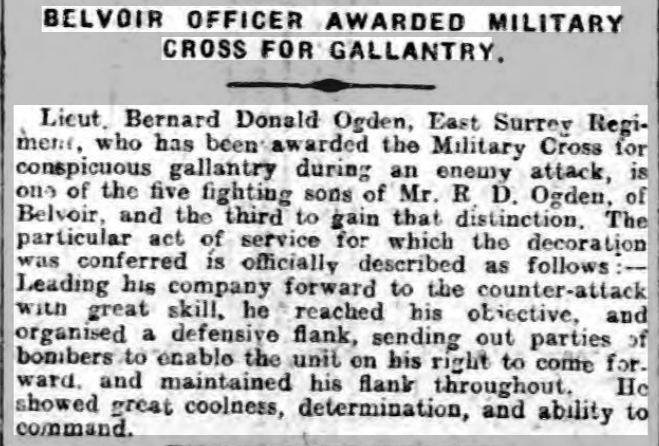 Grantham Journal 16-11-1918 article reporting Lieutenant Ogden's award of the Military Cross. 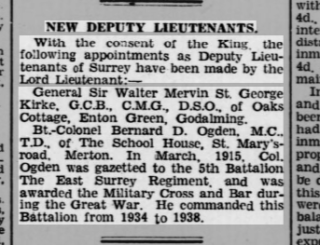 Surrey Mirror, 6-2-1942, Bernard Ogden appointed a Deputy Lieutenant of the county. 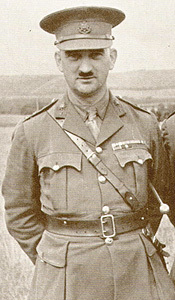 Bernard D. Ogden was awarded the Military Cross in 1918. Bernard Ogden was born in 1887 at Knipton, Lincolnshire, last but one child of Richard and Annie Ogden. His father, Richard (Diverson) Ogden, was born in 1849 at March, Cambridgeshire, and his mother Annie E Ogden (nee Wilson), was born in 1849 in Grantham. In 1881, they lived at 5 Paper Mill Lane, Spittlegate, Grantham. Richard Ogden was an engineer/engine driver at Belvoir Castle. At this time, there were three sons, Frederick (7), Walter (4) and Arthur (1). Richard Ogden’s employment at Belvoir Castle was to last over thirty years. He described himself as an ‘engine driver (stationary)’ in 1891 and again in 1911. It may be that this refers to working an engine used to haul wagons up the Belvoir Castle tramway. By 1891, the family had grown. In addition to Fredrick, Walter and Arthur, there were Cecil (8), Annie (5), Bernard (4) and Amy (1). They now lived in Harston Road, Knipton, close to Belvoir Castle, having moved there shortly after the 1881 Census. Richard Ogden described his employment as an engine driver (stationary). Frederick was working as a pupil teacher. By the time of the Census of 1901, the Ogdens had moved to accommodation in the Engine Yard at Belvoir, but only the youngest three children, Annie W, Bernard and Amy were at home. Mr Ogden was now described as a mechanical engineer. Bernard had an excellent education during which he gained prizes for his work. He attended schools in Redmile and Knipton, before moving on to Bottesford National School, Grantham Technical Institute. He completed a year as a pupil-teacher at Bottesford before gaining a place at St John’s College, Battersea, and going on for there to start his teaching career. However, this was curtailed for the duration of his military service with the East Surrey Regiment. The National Schools Admissions Register (kept at the Leicestershire Record Office), 8th June, 1896, records the admission to Knipton Church of England School of the three youngest Ogden children, Annie, Bernard and Amy, who had previously been at Redmile School. Grantham Journal, 29th October 1904: Grantham Technical Institute annual distribution of essay prizes, which included Pupil-Teachers from Bottesford: Herbert Hudson “Dictionary of Phrase and Fable” and I.H.Bonshor “Discoveries and Inventions of the 19th Century”, and also Day Scholar Bernard D Ogden “Meiklejohn’s English Literature”. Grantham Journal, 23rd September 1905: National Schools. The results of the recent examination in religious knowledge of pupil-teachers in the Peterborough Diocese were made known this week. Bernard D Ogden, of the National Schools, has been placed second in the diocese in the senior or fourth division. Grantham Journal, 14th October 1905: Grantham Technical Institute, prizes included Frank Gilding “Pioneers in Science”, Bernard D Ogden “Discoveries and Inventions of the 19th Century”, and Isaac K Bonshor “Progress of the British Empire”. Grantham Journal, 2nd June 1906: Examination success. The class list of the recent examination of teachers for admission to Training College was published this week. Mr Bernard D. Ogden, Bottesford National School, is placed 2nd Division, 2nd Class, and has been accepted as a student of St. John’s College, Battersea. Mr I.H. Bonshor, of Muston, and Grantham National School, and a former Bottesford scholar, also passed in the 2nd Class, and has been accepted as a student of St Peter’s College, Peterborough. Bernard Ogden’s marriage to Hilda Negus in 1913 is recorded in the General register of Marriages. But more detail is given in the Surrey records [courtesy of the Surrey History Centre]: Bernard D. Ogden, 26, schoolmaster, 31st July 1913, married Hilda Mary Negus, 28, spinster, at Christ Church, New Malden and Coomb. He was son of Richard Dickerson Ogden, engineer. She was daughter of Arthur George Negus, schoolmaster. Colonel B.D. Ogden MC TD commanded 5th Bn The East Surrey Regiment from 9th April 1934 to 8th April 1938 and the 9th Battalion from May 1940 to February 1941. 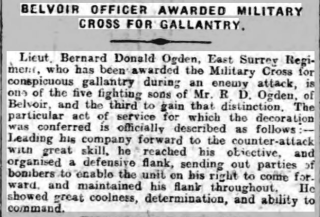 Bernard Donald Ogden enlisted in 1903 in 1st Vol Bn The Middlesex Regiment. In 1914 he joined a TF Bn The Middlesex Regiment and in February 1915 was commissioned in 5th Bn The East Surrey Regiment. He joined the 2/5th Battalion and then was posted to the 8th Battalion in France with whom he served until the Armistice. He was wounded in 1917 and awarded the Military Cross for gallantry. In October 1918 he was awarded a bar to the Military Cross. In 1920 he joined the reformed 5th Battalion and in April 1934 was appointed to command the Battalion. On completion of his tour in April 1938 he was promoted Brevet Colonel and transferred to TARO. He was recalled and in May 1940 was appointed to raise and command the 9th Battalion. He served with that Battalion in England and Northern Ireland and handed over command in February 1941. The 8th Battalion, East Surrey Regiment, was formed as part of the New Army, and landed at Boulogne on the 28th July, 1915. It then saw action in many of the battles fought on the Western Front until the Armistice. Bernard Ogden rose through the ranks, becoming a Captain in 1915. On the 16th October, 1915, the Grantham Journal wrote: Army Promotion. Information has been received that Lieutenant Bernard D Ogden, youngest son of Mr R Ogden of Belvoir, and a Bottesford School “Old Boy” has been promoted to the rank of Captain in the East Surrey Regiment. Captain Ogden’s friends in Bottesford offer him their hearty congratulations. However, his Medal Index Card issued after the end of hostilities referred to him as Lieutenant-Colonel. As already stated, he was awarded the Military Cross after being injured in 1917, and then received a bar to the Military Cross in October, 1918. The Military Cross, instituted on 28th December 1914, is the third level military decoration awarded to Officers. Citations for the M.C. were published in the London Gazette during the Great War. The Gazette, Issue 30997, 5th November, 1918, records that: His Majesty the King has been graciously pleased to approve of the award of the Military Cross in recognition of his gallantry and devotion to duty in the Field. 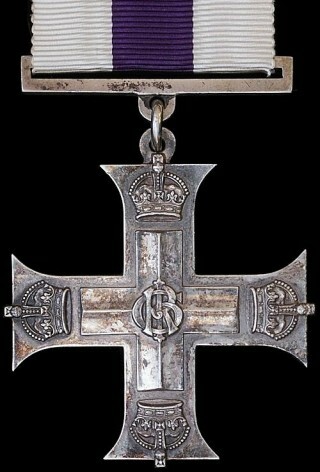 For conspicuous gallantry and devotion to duty during an enemy attack. Leading his company forward to the counter-attack with great skill, he reached his objective and organised a defensive flank, sending out parties of bombers to enable the unit on his right to come forward, and maintained his flank throughout. He showed great coolness, determination and ability go command. The Bottesford school logbook noted that, “Captain Bernard D Ogden has been awarded the Military Cross for gallantry”. Forces War Records points out that Bernard Donald Ogden was also entitled to the 1914 Star or 1914-15 Star, the British War Medal and the Victory medal. Further information including day by day Battalion-level war diaries can be found at the website of the Queen’s Royal Surrey Regiment. The citation in the London Gazette gives no detail about where and when he earned the award, but it may be possible to locate this information in the war diaries. No records of Bernard Ogden living in Bottesford in the 1920s have been found, and it is doubtful that he lived in the East Midlands after the end of the war. The military account provided by the Surrey Infantry Museum (above) makes it clear that Bernard Ogden enjoyed an extended army career through the 1920s and 1930s, ending as commander of the 9th Battalion of the East Surreys from May, 1940, until he relinquished the position in February, 1941, aged 54. He had been a soldier for some 38 years. However, it is clear that he had also played an active role in civilian life, alongside his army commitments. He gained a teaching position in Surrey and went to live there after the end of the war. In 1920, he was recorded by the Teacher’s Registration Council, Merton Park, and was also in the list of members of the Wimbledon Branch of the National Union of Teachers. He was accepted as a member of the Grand Lodge of England, Lunbury Lodge, Hampton Court, on 28th January, 1920. The Surrey Mirror, 9th December 1938, recorded two new appointments of Justices for the County of Surrey, one of whom was Colonel Bernard Donald Ogden MC TD, School House, Church Lane, Merton SW19. In the 1939 Register, Bernard and Hilda Ogden were recorded as living at the School House, St Marys Road, Merton, with their daughter. 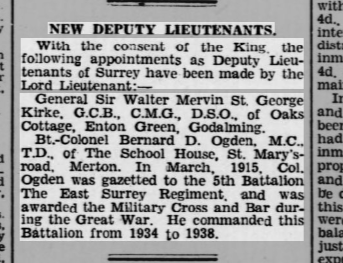 The Surrey Mirror recorded, 6th February 1942, his further appointment as a Deputy Lieutenant of Surrey. Bernard Donald Ogden died on the 27th March, 1961, aged 74, in Sussex. The Grantham Journal, 16th November 1918 alluded to Lieutenant Bernard D. Ogden being one of the five fighting sons of Mr R.D. Ogden, the third to gain distinction. Who were the others? As pointed out already, Richard and Annie Ogden’s sons were Fredrick (born in 1874), Walter (b.1877) and Arthur (b.1879), Cecil (b.1883) and Bernard (b.1887). Frederick Ogden first attested when aged only 13 years 6 months, at Grantham on the 18th March 1886, joining the 4th Battalion of the Lincolnshire Regiment. He was only 4 feet 9 inches tall, and yet was classed as fit for service with the militia at his medical examination. In 1887, he was made a Private. While there is no suggestion that he was sent overseas at this time, or that he was a full-time soldier, it is striking how young a lad could be and be accepted into the militia. He enlisted again, aged 40 years and 2 months, on the 17th December, 1914, becoming Private 38321 with the 8th Battalion of the Notts and Derby Regiment (Sherwood Foresters) and then moving to No.55 Protection Company, Royal Defence Corps. On the 13th September, 1916, he moved to No.6 Coy, and then on the 25th November, 1916, to No.55 Coy. He was finally ‘disembodied on demobilization’ on the 23rd March, 1919, by now some 45 years old, and returned home to 16 Albion Street, Newark. Walter Ogden attested on the 21st August, 1896, at Leicester, becoming 6005 3rd Leicestershires. His home was at 10, Raglan Street, St Mary’s, Leicester, and he had been working for Mr Jewbury, Mineral Water Manufacturer, 6 Hazel Street, Leicester. He was 17 years 11 months old, 5 feet 5½ inches tall. The records add that he left the army on the 26th May, 1898, being “discharged by purchase”. Later, he probably re-enlisted for service during WW1, but as yet his records for this period have not been located. Arthur William Ogden attested at Dover in September 1897 aged 18 and was assigned as Gunner 3471 of the Kent Artillery, having already been in the 2nd Battalion, Lincolnshire Militia. He took part in the South African (Boer) War, and was awarded the Queen’s and King’s South Africa Medal. Detail of his career later in the first decade of the 20th Century are unclear, but he was recorded in the National Census of 1911 as a Staff Sergeant of the Supply Transport Corps stationed at the barracks at Thayetmyo, in Burma, on the Irrawaddy upstream from Rangoon. His service record adds that he married Sarah Ann Morris at Rangoon in 1912, and that they had a child born there. He was later ‘discharged’ on the 27th December 1915 and promoted to Sub-Conductor, which may refer to a move to an administrative role but this is not clear. In the National Register of 1939, Arthur W. and Sarah Ogden were living at 34 De Villiers Avenue, Crosby, Lancashire, with school teacher Ruth M. Plint (Ogden) who was born on the 27th December 1912 and must have been the child born in Rangoon. Arthur was described as ‘Retired India Government (medical grounds)’. He died at Crosby in the following year, 1955, aged 76. Cecil Wilson Ogden attested on the 16th January, 1897, at Grantham, aged just 15. He was in South Africa, 14/3/1901 to 4/11/1902. He was later part of the British Expeditionary Force, end in total served for almost six years, 16/12/1914-1/12/1920, and then staying on until his discharge on the 28th June, 1921. His final rank was Regimental Sergeant Major, his conduct described as “Exemplary”. When he left, his address was 60 Chaworth Road, West Bridgford. Cecil Ogden’s Medal Index Card recorded him as 6DN/3653, D/20976, Sergeant, Acting Warrant Officer Class 1, 6th Dragoons, Corps of Dragoons. He was awarded the 14-15 Star, the Victory Medal and British War Medal. Most significantly, he was also awarded the Distinguished Conduct Medal (DCM) on the 26th June, 1918. The citation was: DCM 6th (Inniskilling) Dragoons, D20976, Sgt.C.W.Ogden, Belvoir. For conspicuous gallantry and devotion to duty. He organised several working parties and collected tools under intense shell and machine gun fire thereby enabling his men to dig themselves in and obtain cover and preventing many casualties. His gallant and determined conduct throughout the day enabled a successful defence to be maintained. Bernard Ogden is described above. We can see that two of the three decorated men of the Ogdens were Cecil Ogden D.C.M. and Bernard Ogden M.C. The third was probably Walter Ogden, although this has not at present been confirmed. They were quite clearly a remarkable military family.